Mary Tantillo talks about how to spot the warning signs and find the best treatment options in the University of Rochester's official podcast. 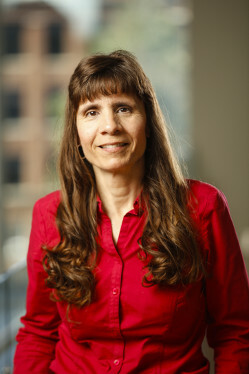 Mary Tantillo is widely recognized for her clinical work and research related to the treatment of eating disorders. She has devoted more than 30 years to providing care and support to patients and families coping with eating disorders across the spectrum of clinical settings. She has conducted research to evaluate an innovative relational/motivational approach to understanding and treating adults with anorexia nervosa through the use of multifamily therapy group. She has also implemented prevention approaches that encourage partnerships among parents and school personnel to create home and school environments that foster wellness and reinforce positive body image. Tantillo directs the Western New York Comprehensive Care Center for Eating Disorders (WNYCCCED), one of three comprehensive care centers in New York State, which works to better coordinate care and services for patients and families and improve outcomes. She is the founder and former CEO and president of a non-profit eating disorders partial hospitalization program for adults and adolescents, The Healing Connection, Inc., an affiliate of the WNYCCCED. She is a fellow of the Academy for Eating Disorders (AED) and past AED board member. Her special interests include women's mental health, family-based treatment, and group treatment, especially multifamily therapy group treatment for eating disorders. Tantillo, M., Marconi, M.A., Rideout, K., Anson, E.A., & Reifenstein, K.A. (2017). Creating a Nursing Student Center for Academic and Professional Success. Journal of Nursing Education, 56 (4), 235-239. Maine, M. D., Samuels, K.L., Tantillo, M. (2015). Eating Disorders in adult women:Biopsychosocial, developmental, and clinical considerations.. Advances in Eating Disorders: Theory, Research and Practice, DOI: 10.1080/21662630.2014.999103. Sanftner, J. L., & Tantillo, M. (2011). Body image and eating disorders: A compelling source of shame for women. In R. Dearing & J. P. Tangney (Eds. ), Shame in the therapy hour. Washington, D.C.: American Psychological Association.. .
Tantillo, M. (2011). The Patient-Family-Clinician-Researcher Quest for Quality. In J. Alexander & J. Treasure. , 485-496. Tantillo, M., & Kreipe, R. E. (2011). Improving Connections for Adolescents Across High-Intensity Settings for the. In D. Le Grange & James Lock (Eds. ), Handbook of assessment and treatment for, 199-219. Sanftner, J.L. & Tantillo, M. (2010). Measuring Perceived Mutuality in Women: Further Validation of the Connection-Disconnection Scale.. Journal of Creativity in Mental Health, 5, 344-357. Tantillo, M., Sanftner, J.L. (2010). Mutuality and Motivation: Connecting with Patients and Families for Change in the Treatment of Eating Disorders. In M. Maine 7 D. Bunnell, &B. McGilley (Eds.) Treatment of Eating Disorders: Bridging the Gap Between Research and Practice. London, UK: Elsevier, 319-334. Tantillo, M., Sanftner, J. (2010). Measuring Perceived Mutuality in Women with Eating Disorders: The Development of the Connection-Disconnection Scale.. Journal of Nursing Measurement, 18 (2), 100-119. Tantillo, M., McDowell, S., Anson, E., Taillie, E., & Cole, R. (2006). Combining supported housing and partial. Eating Disorders: Journal of Treatment and Prevention, 17 (5), 385-399. Tantillo, M., & Kreipe, R. E (2006). The impact of gender socialization on group treatment of eating disorders. Group: The Journal of the Eastern Group Psychotherapy Society, 30 (4), 281-306. Tantillo, M. (2006). A Relational Approach to Eating Disorders Multifamily Therapy Group: Moving from Difference and. , Families, Systems, & Health, 24 (1), 82-102. Tantillo, M. (2004). The therapist's use of self-disclosure in a Relational Therapy approach for eating disorders. Eating Disorders: Journal of Treatment and Prevention, 12, 51-73. Tantillo, M. & Sanftner, J (2003). The Relationship between Perceived Mutuality and Bulimic Symptoms, Depression, and Therapeutic Change in Group.. Eating Behavior, 3 (4), 349-364. Tantillo, M., Nappa Bitter, C., Adams, B (2001). Enhancing readiness for eating disorder treatment: A relational/motivational group model for change.. Eating Disorders: The Journal of Treatment and Prevention, 9, 203-216. Tantillo, M. D (2000). Short-term relational therapy for women with bulimia nervosa.. Eating Disorders: The Journal of Treatment and Prevention, 8 (2), 99-122. Tantillo, M. (1998). A relational approach to group therapy for women with bulimia nervosa: Moving from understanding to action. International Journal of Group Psychotherapy, 48 (4), 477-498. Tantillo, M. (1994). Ricoeurean hermeneutics: Its application in developing a contextual understanding of human experience. In P. L. Chinn (Ed. ), Advances in methods of inquiry for nursing. Gaithersburg, MD: Aspen Publishers, Inc.. .